Yoshi's Island 1 is the first level on Yoshi's Island in Super Mario World, and the first level of the game. Though it is possible to beat the game without playing this level, it is the only way to reach the Yellow Switch Palace and to activate the yellow ! Blocks. Rexes are the most common enemies in Yoshi's Island 1. The level has a grassland theme. 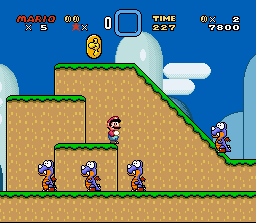 A Koopa without a Shell, sliding down a hill, is at the start of the level. The first Dragon Coin is found here as well, and soon after, a Banzai Bill is shot towards the player, followed by the first Rex. A winged ? Block yields a Super Mushroom. After a couple of more Rexes and the second Dragon Coin, a Super Mushroom pops out of a bush when the player passes. Just after another Rex, the player reaches a blue Warp Pipe containing a Jumping Piranha Plant. 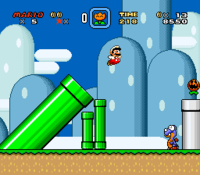 Only the Pipe to the right can be entered, but first the Rotating Blocks have to be destroyed which is not possible when Mario or Luigi are in their small form. Slipping into the Pipe brings the player to a small area underground. The first ever regular Coins of the game can be found here, as well as the third Dragon Coin. To reach the latter, the player has to destroy the Rotating Blocks again. Leaving the room causes the player to be shot out of the Warp Pipe and right through the Midway Gate. When choosing not to use the underground way, the player finds another Jumping Piranha Plant and Rex. The Message Block ahead provides information about using the Item Storage. After a series of Rex, the fourth Dragon Coin can be found on top of a hill; the hillside allows to slide down and defeat the oncoming Rex. If Mario or Luigi is in his big form, ducking right after sliding is recommended, because there is another Banzai Bill. Soon after, the player reaches another Message Block, telling him about picking up and throwing a Shell. The player can use exactly this hint at this point: he can pick up the Red Shell ahead and throw it up to hit the Rotating Block which releases a 1-Up Mushroom. The 1-Up Mushroom moves over the clouds above and finally falls down to the right. Having the yellow ! Blocks activated is useful here to catch the 1-Up Mushroom as it drops. A bit further, the player finds a ? Block which contains a Super Mushroom or a Fire Flower, depending on Mario or Luigi's current form. After another Banzai Bill and a Jumping Piranha Plant, the fifth and final Dragon Coin can be found, followed by the Giant Gate. This, however, is protected by a Chargin' Chuck, the first in the game. When not stomped on, the Chargin' Chuck does not move, instead continually jumping up. Dragon Coin 1: Next to the slanted platform with the Koopa without a Shell. Dragon Coin 2: Next to the set of three slanted platforms. Dragon Coin 3: In the underground area, under three Rotating Blocks. Requires a Spin Jump. Dragon Coin 4: On top of a bigger set of three platforms. Dragon Coin 5: Just before the Giant Gate, next to a green Pipe. This page was last edited on April 17, 2019, at 20:02.